By: Janowski, Diane L.; Smith, Allen C.
Authors Diane L. Janowski and Allen C. Smith combine an interest in the evolution of the commercial and residential landscapes in their home town with an exquisite collection of images in The Chemung Valley. This engaging pictorial history captures the people of Elmira, New York, at work and at play and preserves the memories of yesteryear. In The Chemung Valley, discover the people and places of Elmira's early days as well as scenes from other areas of Chemung County, including Horseheads, Elmira Heights, Big Flats, Pine City, and Pine Valley. 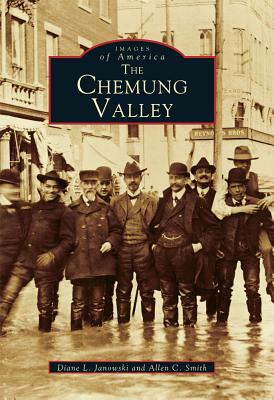 The images in this edition, all of which were selected from the permanent collection of the Chemung Valley History Museum, represent all aspects of life in these communities. Both authors are award-winning creative photographers. Author Name: Janowski, Diane L.; Smith, Allen C.